Dr Rebecca Stack reviews 'The Place is Here' exhibition at Nottingham Contemporary. Do you remember the 80’s? Not just the creative hair (mullets, high-top fades, puffed-up back combs… the quiff), but Thatcherism, the struggle to end apartheid, social unrest, riots and anti-fascism. ‘The Place is Here’ exhibition at Nottingham contemporary represents the political turbulence and social inequality through the eyes of marginalised people in the 1980s. This exhibition brings together over 100 works from a range of writers, artists, thinkers and film makers. 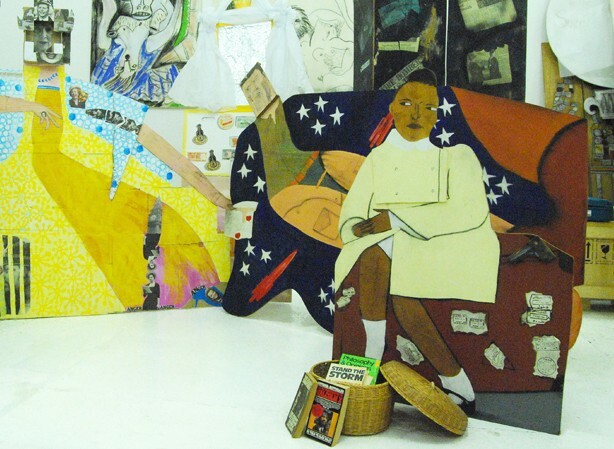 Across the four exhibition rooms of the Nottingham contemporary, topics such as Margaret Thatcher's anti-immigration policies, black feminism, Asian film and apartheid in South Africa are addressed through paintings, sculptures, posters, film and texts. The films presented as part of the exhibition were captivating and moving; one particularly interesting documentary (that was originally not aired and is believed to have been suppressed) explored the origins of the social unrest in Brixton, Handsworth and Tottenham. The photos catalogue a history of protest including a photo of anti-national front demonstrations in Birmingham city centre, and other examples include a selection of four anti-racism posters. The photo archive also presents traditions such as the dead yard/house (a Caribbean funeral tradition) and celebrations such as the Handsworth carnival in the 80s. Throughout the exhibition, strong messages about the purpose of culture, identity formation, prejudice, implicit biases, power and injustice were communicated. All of these topics are explored and addressed in psychology (Graham Richards outlines psychology’s relationship with race in his 2012 book ‘Race, Racism and Psychology – Towards a Reflective History'). In three to four decades from now will we look back at our contemporary art, film and artefacts of our time with admiration for those who provided an active voice against discrimination, inequality, prejudice, the politics of injustice and the resurgence of divisive political views? I hope so. And amongst those voices taking a stand, will we hear the words of psychologists? If so 'the time is now and the place is here'. - Reviewed by Dr Rebecca Stack, Lecturer / Senior Lecturer in Psychology at Nottingham Trent University. The exhibition runs until 30 April.